Beyond the boundary, space is — perhaps counterintuitively — much denser with particles. There are 80,000 particles per cubic meter in the region where Voyager I is now. The sun’s hot ejecta — a plasma of charged particles — forms a vast bubble, known as the heliosphere. In the outer regions of the heliosphere, the particles are relatively few and far between, with just 1,000 particles per square meter in some regions. But the heliosphere has an edge that Voyager crossed in August 2013. This confirms earlier findings that Voyager I on that date in August 2012 had experienced a sudden drop in solar radiation and a spike in cosmic particles coming from all around the galaxy. But the earlier data from the spacecraft had been somewhat ambiguous. The spacecraft continued to pick up magnetic signals that suggested it was still within the sun’s magnetic field (3). 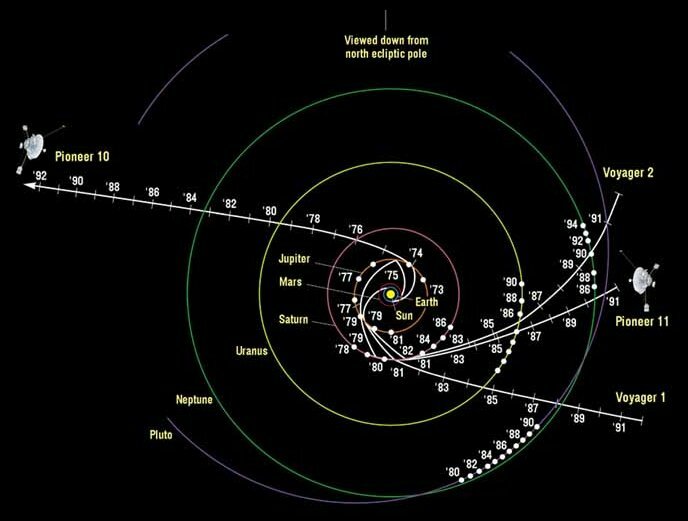 Ed Stone, the chief scientist for Voyager, suggested that Voyager I was flying through a transitional zone. These two spacecraft represent a pursuit of mankind to reach further into the cosmos than ever before. On the two probes there are two “Golden Records” which contain images and sounds of life on Earth. Thus the Voyager expedition also poses deep thought into the realm of the unknown and to who or what may find these probes eventually.